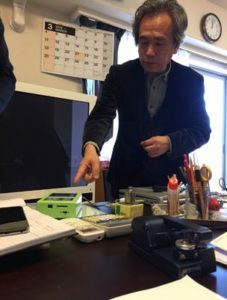 Hashimoto-sensei showing the ai-Phase instruments in his office. Recently a delegation of Kagaku staff traveled to Japan to visit our partners at ai-Phase. Upon reaching Tokyo, we were introduced to the company’s founder, Prof. Hashimoto-sensei, who recently retired from Tokyo Institute of Technology, along with his assistant, Yukiko-san, at their company office. Prof. Hashimoto is still very much engaged in the ai-Phase development work. It is obvious that Prof. Hashimoto is dedicated to make his (and his colleague Prof. Morikawa-sensei’s) instrument better in the senses of ease-of-use and versatility. On display in Hashimoto-sensei’s office was the full spread of the ai-Phase thermal diffusivity instrument in its iterations over time, from the inception-era, orange-with-flower decoration M1, to the current dark-metallic M3. The company’s name, ai-Phase is composed from the Japanese word “ai”, which means “love”, coupled with “Phase” for shifts in temperature. The ai-Phase instruments are modestly sized, with a slick “hammer and anvil” design. The relevant sample is placed on a small block (the anvil if you like) upon which a raised arm gently comes down, hammer fashion, to sandwich the sample tight. 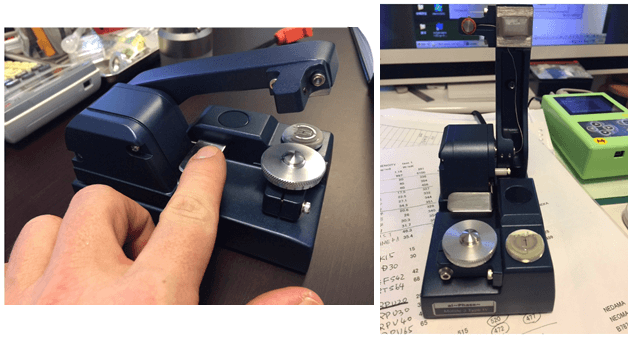 Different weights can be placed on top of the arm to achieve certain pressures, ensuring good thermal contact or controlled compression of the samples. The latest model-in-development includes the option to directly measure the film thickness as mounted on the device. This is a clever upgrade, as the film thickness is a crucial parameter for the measurements. For soft and liquid samples, the arm can rest on a support with a fixed distance between Heat Source and Heat Sensor, so that a set thickness is defined. The current Mark III model, M3, tackles samples of a minimum thickness of 10 microns. The weight of the measurement device is ca 800 g, this unit is then paired with a control unit of similar ca 1000 g weight. Being very light and compact, the instrument is by any accounts a fully portable system. On display throughout the visit was also the clear and efficient ai-Phase Windows PC software. The ai-Phase Mobile 3 on display in Tokyo. Currently the ai-Phase instrument is geared solely towards the Japanese market, where over the past seventeen years (since 2002) over 200 units have been sold, mainly – and notably – to industrial rather than academic clients. Patrons include Sharp, NEC, Panasonic, Hitachi, Asahi, Canon, DIC, Toyota, Denso, Honda, Weibo and TDK. Worth noting is that sectors in which the instrument is being utilized today, in addition to the obvious electronics industry, span over pulp and paper, printing, glass, adhesive, paints, and steel. Most commonly, measurements are done on composite materials of thin-film type. The ai-Phase instrument is widely used as a QC tool for industry to date, but Prof. Morikawa reassured us that it will perform excellently in research laboratories as well. The instrument follows ISO 11953 as well as ISO 22007-3. For the future, ai-Phase places its hopes in the instrument gaining even more shares in QC-testing-; Solar Cell-; and Thin Film-testing markets, while expending the geographical reach outside of the Japanese islands. We at Kagaku see growing potential in the device on our markets in Europe and China. A sincerely “Thank you!” to the ai-Phase team for welcoming us so generously and for showing their excellent product! We are thrilled to take this collaboration to another level. More information on the ai-Phase instrument can be found here on the Kagaku homepage. We urged you to visit ai-Phase own website, which you will find here.